‘Far too many New Zealanders have come to view today’s capitalism not as their friend, but as their foe. And they are not all wrong. That is why we believe that capitalism must regain its responsible, its human face. We’ve had to make a choice, whether it was either with National or Labour, for a modified status quo – or for change. In our negotiations, both National and Labour were presented with that opportunity. Working together, co-operating together for New Zealand. We choose a coalition government of New Zealand First with Labour’. With those dramatic words Winston Peters, this most extraordinary man, wrote himself a permanent place in New Zealand history. The Labour-NZ First coalition Government 2017- New Zealand’s brand new start. So first of all I warmly congratulate new Prime Minister Jacinda Ardern and her coalition government. We know Jacinda well. Her extraordinary personal transformation as leader of the Labour Party certainly not only saved Labour from another, possibly fatal, defeat, it propelled her and Labour to what would have seemed only a few weeks ago, a most unlikely victory. And to Winston, a long-standing Ponsonby resident, our congratulations and thanks. Jacinda’s sparkling charisma which has proven to shine brightest at the highest level of politics, however was not quite enough. Two fundamental errors cost Labour votes – especially in Auckland. The sudden announcement of a capital gains tax, as has been well discussed, was ruthlessly exploited by National. It associated the newly invigorated Labour with the losing performance of the party under Phil Goff in 2011 and David Cunliffe in 2014. The capital gains tax idea, along with the equally unpopular rolling back of superannuation had been dumped by Andrew Little but Labour’s Treasury-friendly old guard evidently persuaded the new leader to take it up again. Secondly the trams-to-the-airport policy was widely seen by Aucklanders as flaky – even among staunch Labour voters. These two policies served to raise fatal doubts among just too many swing voters. The trams policy too came from her old mentor Phil Goff but actually originated from the immensely powerful but widely distrusted Auckland Transport. It is supported by a small claque of Auckland Transport’s social media assets and their associates in the Greens – but not much anyone else. Everyone makes mistakes. The mark of distinction is whether one learns from them. There is every evidence that our new Prime Minister does learn from mistakes and therefore will be a stronger leader for that. The ‘captain’s call’ on capital gains was soon reversed and I am hoping common sense will also prevail over the trams-to the-airport policy. 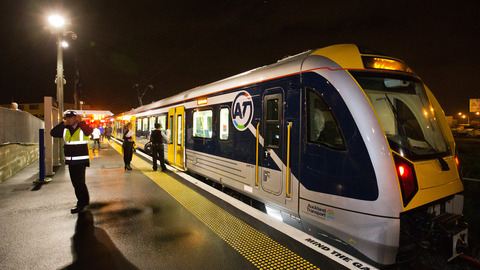 A rail link to the airport using high capacity fast electric trains is what Mr Peters has made very clear he prefers and without doubt the overwhelming majority of Aucklanders, whatever party they voted for, agree with him. Obviously the policy arrangements of the new coalition government have not yet been made clear by the time this article goes to press. But from Mr Peter’s remarkable statement foreshadowing his party’s decision it is clear there will be a movement away, significant ‘change’, from the neoliberal paradigm that has determined the economic policies of both National and Labour for well over a generation. Again without knowing the details, this change also reflects well on the leadership talents of Prime Minister Ardern. Ironically the shift to the left has come from the right, ie New Zealand First, (please excuse my using the terms ‘left’ and ‘right’ which are now just about past their use-by date as these events demonstrate). 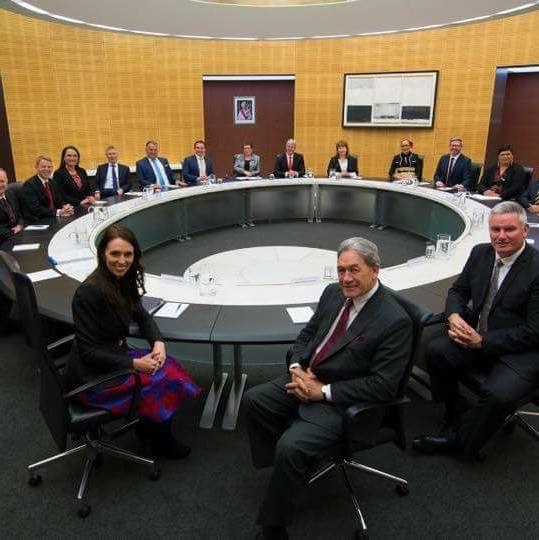 However in conceding such a shift, Prime Minister Ardern is actually moving Labour policy back to its core philosophy and the instinctive preferences of its constituency – as opposed those of the Wellington-based ‘beltway’ leadership. Such a move strengthens the party at its foundations and moves NZ Labour in the same direction as the British Labour Party under the now widely-respected Jeremy Corbyn (once sneered at by the same ‘belt-way’ people). This is not only right up with international trends, but because NZ Labour is now actually in power – it actually puts Labour ahead of the curve. To commit to such a profound policy change makes the Prime Minister too an historical figure. That incomparable political commentator Machiavelli once observed ‘The first method for estimating the intelligence of a ruler is to look at the people he has around him.’ [or her]. The lesson from the election campaign I hope will be that the new Prime Minister will be thinking very hard about the quality of advice she has been given by her old mentors. Mr Peters I hope will not only be Jacinda’s deputy but also her trusted advisor. Winston Peters is an extraordinary politician who for the last few weeks has held the whole country in his thrall. Indeed it might be said a worker of political magic on the scale of the Polynesian demi-god Māui-tikitiki-a-Taranga. He is also a New Zealand patriot, a man of substance, of integrity and courage whom history has called forward in the country’s hour of need. This is an extraordinary story – and it has only just begun. Readers of this site will be aware of the concerns I have been raising about the scale of pollution of our inner harbour and streams from sewage- contaminated stormwater. While the problem has been down-played by officialdom for years, thanks to the lobbying of the locally-based ‘Coalition’ (‘Stop Auckland Sewage Overflows’) and other citizens, the council appears to be moving out of the state of denial it was in only a few months ago and is promising to tackle the problem. We shall see. While the pollution of the Waitematā is real and on-going, over the last year I have been involved in raising awareness of another threat to our marine environment; this time in the outer Hauraki Gulf. While this threat is still only a potential one, it could be catastrophic in its consequences. The problem is oil trapped in the wreck of the Niagara. RMS Niagara was a NZ Union Steam Shipping Co trans-Pacific liner sunk early in World War II in a mine ambush laid by a German navy raider. Niagara was built in 1913 for the Canadian – Australasian service. Such was its size and opulence she was known as ‘the Queen of the Pacific’. 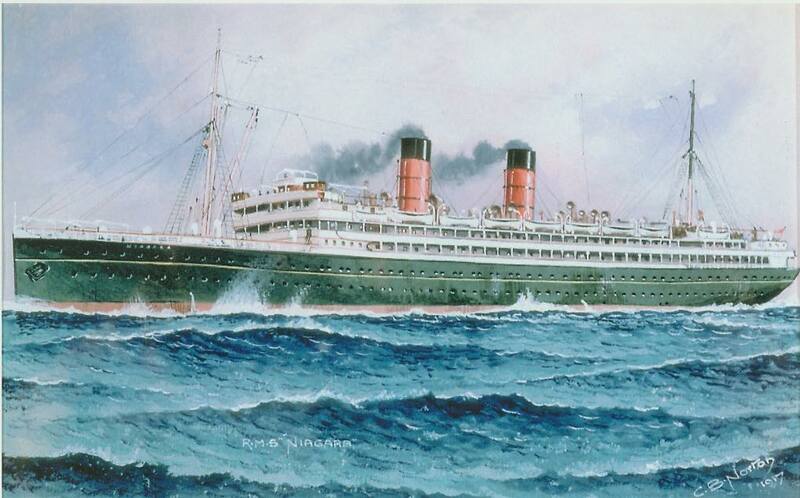 RMS Niagara – ‘Queen of the Pacific’ – sunk by the German Navy June 1940. Painting by E.B. Norton. (Australian National Maritime Museum Collection, courtesy Searov Technologies). On 20 June 1940 (only two weeks after the Dunkirk evacuation), a few hours after sailing from Queens Wharf bound for Suva, Niagara struck the mine and sunk. Fortunately all 349 passengers and crew were rescued (and most of the 8 tonnes of gold she was carrying later salvaged). Niagara was also carrying a cargo of armaments, half the rifles and ammunition in New Zealand, hastily dispatched to Great Britain in her hour of need after Dunkirk. The wreck lies at a depth of 120 metres, equidistant from the Mokohinau and Hen and Chicken Islands, just over 2 nautical miles inside the Auckland Coastal Marine Area and the Hauraki Gulf Marine Park. The alarm was first raised by diver and conservationist Wade Doak and ROV expert Keith Gordon. Keith who wrote the authoritative history of the ship, ‘Deep Water Gold’, believes there is at least 1600 tonnes of bunker oil trapped within the wreck. He points out that other wartime wrecks are now collapsing and releasing oil – creating environmental headaches for Pacific nations like the Solomon Islands and the Federated States of Micronesia. After being contacted last year by marine biologists and seabird scientists, I got involved. Since that time I have been working with Keith, and an international marine salvage expert Clive Sharp, trying to get something done about it. In August, Keith, Clive and I, along with Karen Baird of Forest & Bird and Birdlife International, presented to the Northland Conservation Board where we received similar support. There has also been growing media interest. The amount of oil that escaped from the Rena in 2011 was only 350 or so tonnes and we saw the damage it caused. The amount of oil in the Niagara is estimated to be four or five times that. The outer Gulf is an ecological hotspot – of world importance, especially for seabirds. It is also near some of our most important marine protected areas, the Poor Knights, Leigh and Tawharanui Marine Reserves. Waiting to react to a major pollution event is not tenable. The chemical dispersants normally used to deal with oil spills are highly toxic in themselves, as damaging to marine life as the oil. Preventative action is therefore needed. The oil needs to be extracted. The sinking of the Niagara was an act of war against New Zealand – 72 years after the Second World War, this act of war still presents a clear and present danger. A version of this article appears in the October 2017 edition of Ponsonby News. The announcement by Ports of Auckland chairwoman Liz Coutts that it was ‘no longer acceptable’ for the port to reclaim the harbour was the most sensible utterance from any city leader on this subject for some time. But while Mayor Phil Goff continues to wrestle with his puzzling problem of how to sell the port and at the same time move the port, the prospect of another America’s Cup defence has returned the council’s focus to the rest of the waterfront. In 2012, building on the momentum began by the Auckland Regional Council (ARC) in the Wynyard Quarter and the opening of Queens Wharf, Waterfront Auckland produced the Waterfront Plan. Created with a great deal of public participation, it was visionary and at the same time practical. However due mainly to rivalry between Waterfront Auckland and Auckland Transport in particular – critical momentum was lost. Subsequently in 2015, on the recommendation of the council chief executive, Waterfront Auckland was ‘reviewed’ out of existence. Its assets and waterfront-focussed mission was absorbed into another CCO, Auckland Council Properties Ltd, the entity given a new name ‘Panuku Development Auckland’, and with it a portfolio of non-waterfront-focussed responsibilities such as redeveloping the former Manukau City centre. In recent weeks Panuku and Auckland Transport officials have been busy ‘refreshing’ the Waterfront Plan in public-excluded ‘workshops’. The proposals being rushed through entail significant departures from the Plan – without any intention of public consultation or input. As they presently stand many of the proposals (eg moving cruise ships from Queens Wharf to a significantly extended Captain Cook Wharf) are impractical and will destroy economic value and are therefore even more expensive than claimed. Meanwhile of more urgency is the plight of one of Auckland’s oldest waterfront heritage icons, the harbour ferry Kestrel. This lovely old lady, the last of the big double-ended Waitemata ferries still afloat, could be lost forever if Panuku managers continue to stymie plans for her restoration and permanent place on our waterfront. In recent years Kestrel had been owned by a charitable trust, the Kestrel Preservation Society. With backing from the ARC chairman’s discretionary fund in the last days before the ‘Super City’ and subsequently Waterfront Auckland, the Society did good work in rescuing her from Tauranga, bringing her back to Auckland and maintaining her. In March 2016 however, Kestrel sank at her moorings, dashing the restoration hopes of the under-resourced Society. But thanks to the intervention of Waterfront Auckland’s former CEO John Dalzell, Kestrel was refloated, her hull repaired and a purchase negotiated with a private developer, Darby Partners. They have come up with an exciting plan that has Kestrel the centre-piece of a visionary harbour-edge development, including boutique hotel accommodation and a restaurant. Interestingly Darby Partner’s preferred site, presently an unprepossessing office building and cafe, on Z Pier at inner Westhaven, is a stone’s-throw from the old Bailey’s shipyard where Kestrel was built over 112 years ago. Unfortunately Panuku managers are claiming such use of the site is at odds with the Waterfront Plan (rather ironic given their secret plans to change it). Instead they want to push the project off to what the developers consider a commercially unsuitable site – one moreover already leased to Sandford. Prior to the 2016 sinking, the Kestrel Preservation Society struggled to obtain funding for restoration. Given the lack of interest from Auckland Council and the Maritime Museum, if Kestrel cannot be restored as part of a viable commercial venture, then she is likely headed for the breakers’ yard. Unhappily Panuku is doing what bureaucracies all too often do – taking forever to make any progress, prevaricating over options while charging $5000 a month for Kestrel’s berth. One can only ask why such an excellent development, one providing a rare opportunity for privately-financed maritime heritage restoration is being squandered? It is quite tragic that such a magnificent harbour city should be inflicted with such mediocre decision-making. Auckland deserves better than this. After years of delays Parnell Station finally opened in March – but for Southern Line services only. Western Line and Onehunga trains don’t stop during weekday working hours, and Auckland Transport (AT) management remains uncommunicative about when they will. Given the length of time (since 2007) I have been lobbying to get the station built, my misgivings about what I felt to be its premature opening may seem ironic. But even now, five months on, the station is far from complete. Parnell Station. Though the station is incomplete – with no work apparent for months – it is increasingly popular with commuters. First of all a walkway proposed and funded by the Waitematā Local Board, to connect the station to Stanley Street via Nicholls Lane to serve Auckland University won’t be finished until at least December. AT has also failed to build an underpass to connect the two platforms. More than a passenger-unfriendly inconvenience, the temptation to save a 100-metre plus walk by just dashing across the track is a safety hazard, especially in such a busy part of the network. Nor is there yet wheelchair or disability access. And signage to the Museum is non-existent. These defects and others have drawn the ire of bloggers but instead of criticising AT, the anoraks have turned their politically-motivated bile on me – for having the station built there in first place. No surprise that these are the same beady-eyed zealots who targeted me for opposing aspects of the Unitary Plan before last year’s local elections. I am more than happy to take all the credit for the station’s location, in the historic Waipapa valley (for so long a wasteland), handily placed to Parnell Village, Auckland Domain, Auckland War Memorial Museum (surprisingly close, 7 minutes walk, from the Museum’s doors), planned intensive residential developments and Auckland University, but that wouldn’t be fair to the Parnell Business Association, Parnell Community Committee, Parnell Heritage, Parnell Trust, Auckland Museum and the Waitematā Local Board.The station’s real success story thus far, is its centre-piece, the splendidly restored 110-year-old heritage station building, designed by renowned railway architect George ‘Gingerbread’ Troup, of iconic Dunedin railway station fame. Thanks to former AT project manager Nick Seymour; and to KiwiRail for fulfilling a commitment made in 2007 to the ARC whose elected members saved the old building from demolition when it was at Newmarket. KiwiRail under the direction of General Manager Brent Lancaster and heritage architect Dave Pearson of DPH Architects, engineers Structural Design Ltd, the KiwiRail Project Management Office (Aiman Grace and Markum Ellis), and builder Libbet have done a superb restoring this prime example of Auckland’s railway heritage. 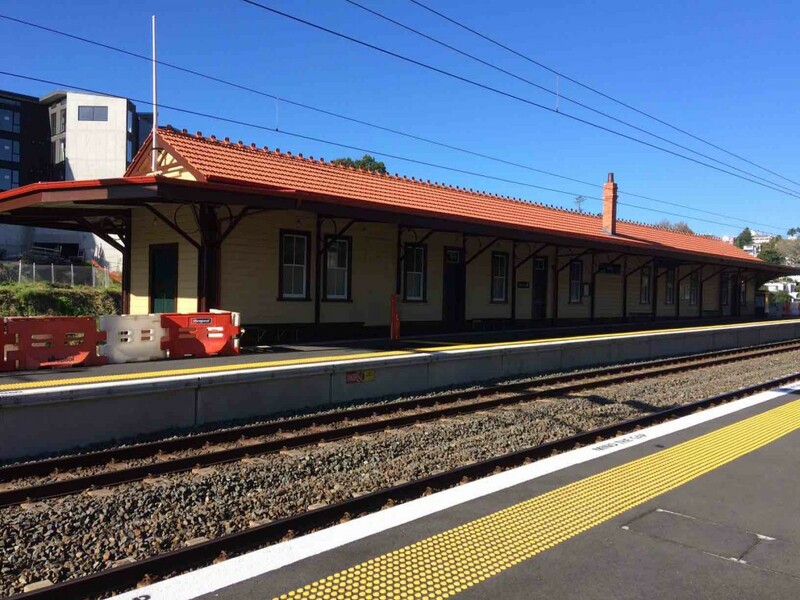 KiwiRail has re-tiled the roof, reproducing the original Marseilles tiles, replaced the chimney, retained the original doors and windows restored to their original appearance and functionality, strengthened and replaced the corroded stanchions of the surrounding veranda, removed inappropriate modifications, and strengthened and repaired compromised aspects of the structure. Resplendent in its traditional railway station colour scheme of Canterbury Clay, Deep Chocolate, Marino, Ivy Green and Pioneer Red, the kauri building has both the sturdy workmanship and the elegance typical of the Edwardian era – Auckland’s ‘belle epoque’. The historic station building, the Auckland War Memorial Museum, and the Parnell Village evoke a common heritage theme for visitors to Parnell. The station is the new gateway and the central link for these attractions only a few minutes by EMU trains from Queen Street and Queens Wharf Cruise Ship terminal. The restoration of the building’s interior is an essential next step in making the most of its full potential – and also to enhance its physical security. However in order to persuade Auckland Transport to get on and complete the job, there needs to be a community consensus on its future use. I welcome the leadership of Cheryl Adamson of the Parnell Business Association in organising a community-led approach to achieving this. I personally support a mix of commercial and community use for the building, with promotion of the Auckland Museum also essential. As a user of the station the ability to buy a ‘to go’ coffee would be great. I am sure the early-bird commuters there on dark winter’s mornings, almost all of them heading south, would appreciate a coffee as well. This article appeared in the September 2017 issue of The Hobson. When I last wrote about Motukorea – Browns Island in February, I promised to keep readers posted on progress – so here goes. To recap – after the island was rescued from the ignominious fate of becoming Auckland’s sewage outfall thanks to the heroic efforts of Dove-Myer Robinson, in 1954 it was purchased and generously gifted to the ‘Mayor, councillors and people of Auckland’ by brewery magnate Sir Ernest Davis. The island was managed for many years by Lands & Survey and then DOC until in late 2015, after an attempt by the government to include it in a Treaty settlement, Auckland councillors decided that it was time the council took management responsibility itself. 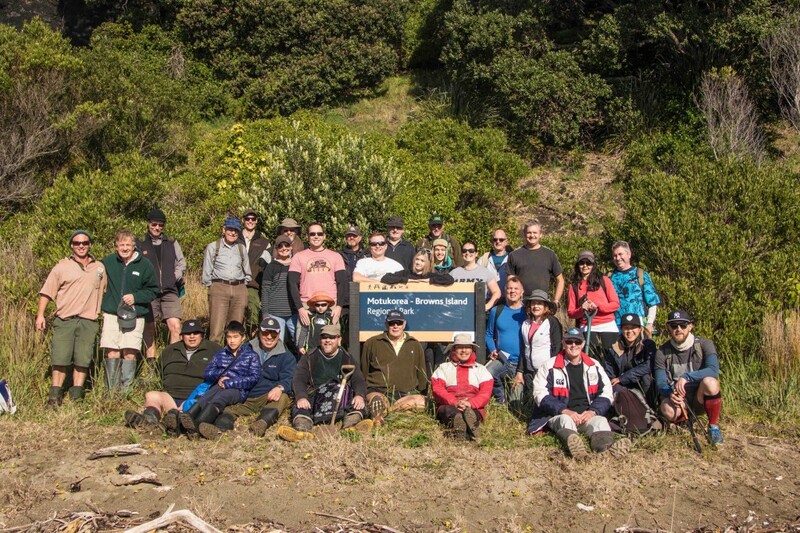 That has now been delegated to the popular and highly respected regional parks service – making Motukorea – Browns Island our latest regional park. Parnell Station building designed by the famous railways architect George Troup and built in 1908. Superbly restored by Kiwirail. Now for an update on the new Parnell train station. 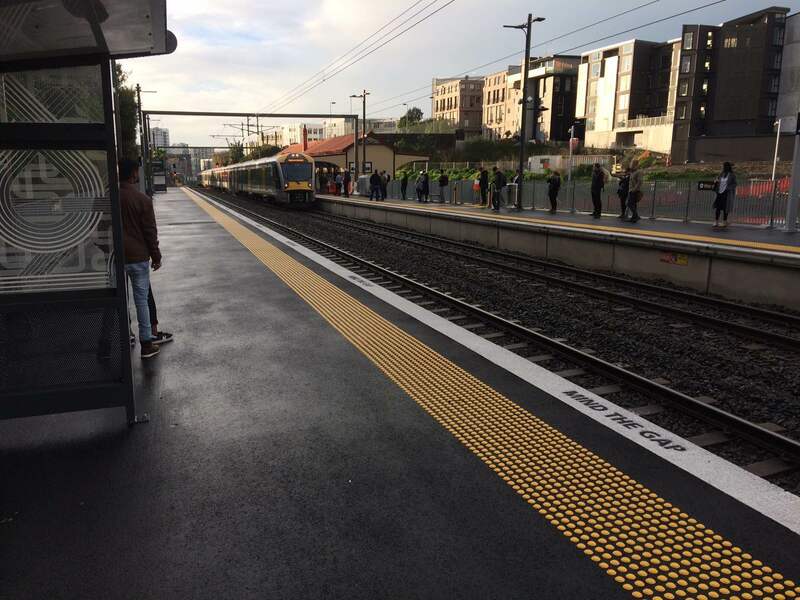 An article I wrote last year was entitled ‘Parnell Station – a long time coming’; how true that is. The station was opened by Auckland Transport (AT) in mid-March, but only for Southern Line services only. 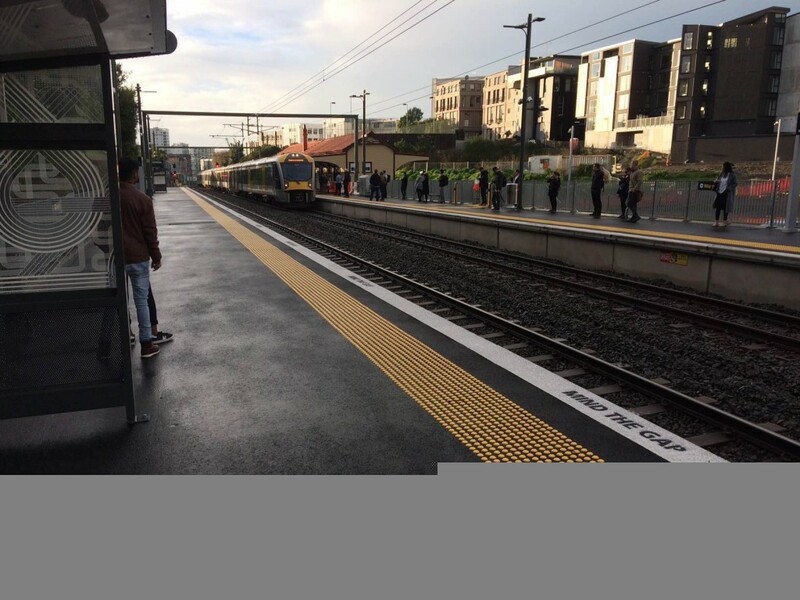 Western Line and Onehunga trains are not stopping during weekday working hours, and AT management remains uncommunicative about when they will. Ironically given my efforts over many years to get the station built, earlier this year I met with AT to express my concern about opening the station when it was nowhere near finished. First of all a walkway proposed and funded by the Waitematā Local Board, designed to connect the station to Stanley Street via Nicholls Lane to serve Auckland University was not in place and won’t be until late December. AT has also failed to build an underpass to connect the two platforms. More than a passenger-unfriendly inconvenience, the temptation to save a 100-metre-walk by just dashing across the track is a serious safety hazard, especially in such a busy part of the network. Nor is there yet wheelchair or disability access. And signage to the Museum is non-existent. These defects and others have drawn the ire of bloggers but instead of criticising AT, the anoraks have turned their politically-motivated bile on me – for having the station built there in first place. No surprise that these are the same beady-eyed intensification zealots who targeted me for opposing aspects of the Unitary Plan before last year’s local elections. I am actually more than happy to take all the credit for the station’s location, in the historic Waipapa valley (for so long a wasteland), handily placed to Parnell Village, Auckland Domain, Auckland War Memorial Museum (surprisingly close, 7 minutes walk, from the Museum’s doors), planned intensive residential developments and Auckland University, but that wouldn’t be fair to KiwiRail and AT engineers, the Parnell Business Association (formerly Parnell Inc), Parnell Community Committee, Parnell Heritage, Parnell Trust, Auckland Museum and the Waitematā Local Board. The station’s real success story thus far, is its centre-piece, the splendidly restored 110-year-old heritage station building, designed by renowned railway architect George ‘Gingerbread’ Troup, of iconic Dunedin railway station fame. Thanks to former AT project manager Nick Seymour; and to KiwiRail for fulfilling a commitment made in 2007 to the ARC whose elected members saved the old building from demolition when it was at Newmarket. KiwiRail under the direction of General Manager Brent Lancaster and heritage architect Dave Pearson of DPH Architects, engineers Structural Design Ltd, the KiwiRail Project Management Office (Aiman Grace and Markum Ellis), and builder Libbet have done a superb restoring this prime example of Auckland’s railway heritage. The historic station building, the Auckland War Memorial Museum, and the Parnell Village evoke a common heritage theme for visitors to Parnell. The station is the new gateway and the central link for these attractions only a few minutes by EMU trains from Queen Street and Queens Wharf Cruise Ship terminal. Like the actual station itself, due to decisions made (or rather not made) by Auckland Transport the restoration of interior of the heritage building is yet to be agreed upon but this is an essential next step in making the most of its full potential. However in order to persuade Auckland Transport to get on and complete the job, there needs to be a community consensus on its future use. I welcome the leadership of Cheryl Adamson of the Parnell Business Association in organising a community-led approach to achieving this. I personally support a mix of commercial and community use for the building, with promotion of the Auckland Museum also essential. As a user of the station the ability to buy a ‘to go’ coffee would be great. I am sure the early-bird commuters there on dark winter’s mornings, almost all of them heading south, would appreciate a coffee as well.. Finally the present situation of a locked and sealed station building is a real security risk. This same building has already survived on arson attempt during its time at Newmarket. Its needs to be opened, completed and ‘warmed’ by community occupation and use. KiwiRail deserves a lot of credit for honouring its obligations so successfully. We are confident the new Parnell Station, like the station building itself will stand the test of time. It’s now over to Auckland Transport to get on and get the job finished. A version of this article appears in the August 2017 issue of Ponsonby News. Time and patience running out for the Super City? Auckland has had the Super City for more than six and half years now and for a lot of people it’s starting to feel like a sentence. It should be recalled Aucklanders were never allowed to vote on this massive amalgamation – the government just imposed it. Over time even the Auckland Council’s own polling has revealed the council has become increasingly unpopular – and mistrusted. The election of a new mayor has made little of the hoped-for difference – in many respects the situation is worse now than before. So in addition to the disaffected communities of Waiheke and North Rodney, it’s not surprising that thoughtful commentators from across the political spectrum are speaking out about an Auckland Council that is perceived to be becoming increasingly ineffective and undemocratic. Leading the charge is National Party elder statesman Terry Dunleavy who recently in a ‘Herald’ opinion piece delivered a withering verdict on the Super City – the National government politicians, he declared, ‘got it wrong – and imposed their own mangled monstrosity on our largest metropolis’. Dunleavy’s critique was taken up by Emeritus Professor Ian Shirley who was prescient enough to see it coming. In 2010 he warned that proposed Super City had ‘a corporate structure where the major beneficiaries will be the exclusive brethren of big business, merchant bankers and a narrow range of consultants dominated by legal and accountancy firms’. How right he was. But with a flying start under the leadership of the effervescent Mayor Len Brown, things at first looked promising. But the truth is the Super City was financially crippled from the start by the fatal decision to buy a brand new IT system that has ended up costing $1.2b and some $70m a year to operate. This was compounded soon after by decisions around office accommodation – especially the decision to buy the ASB tower on Albert Street (a faulty tower indeed) spending on which is still ongoing; and the consequent abandonment of the Civic Administration Building on Aotea Square, 18 floors and 14,000 square metres in the hear of the CBD, deserted for over two years. After the initial spend and borrowing spree (much of it on itself) the council approaching its debt ceiling and fearful of pushing its luck too far with ratepayers is now resorting to selling key assets. First on the block is the Diversified Financial Asset portfolio, a legacy of the Auckland Regional Council. Prudently managed by Infrastructure Auckland and then Auckland Regional Holdings, its investment returns along with Ports of Auckland dividends, enabled the region to pay for the Northern Busway, the Britomart Transport Centre and to rescue and rebuild Auckland’s rail network and services from the very brink of extinction. I will leave the last word to Professor Shirley. ‘We don’t need another review of governance, what we need is a cleanout in September of the Wellington swamp that delivered us the Super City and as structural change to those policies that continue to undermine the development of Auckland today’. Mayor Phil Goff’s intentions regarding the Ports of Auckland always struck me as quite ambiguous. While he has been free with comments about wanting to physically move the port… to the Firth of Thames, to the Manukau Harbour, to anywhere…I have noticed he has always fallen silent when the question of his commitment to public ownership of the port comes up – ‘coy’ as NZ Herald’s Bernard Orsman puts it. However plans to sell the Ports of Auckland have now been flushed out into the open after a secret meeting involving Goff and the chair and CEO of the port company was leaked to the media. The port is the council’s principle revenue-earning ($40m – $50m per annum) strategic asset. Relinquishing that income stream would require an extra 3% plus rates increase every year to make up the difference. The leak forced Goff to make what he and his communications people considered looked like a denial – a ringing declaration that the port company land was not for sale. In his email to councillors Goff claimed the port sale story was ‘factually wrong’ but that he did discuss, ‘whether the Ports should be divided into a Property Company and an Operating Company’. Separating out the ‘land’ and selling off the revenue-earning operating business is a ploy long used by those scheming to privatise the port. When I was chairman of the Auckland Regional Council I had to deal on a regular basis with hard-faced international finance people (including the Sultan of Dubai) wanting to get their hands on the people of Auckland’s blue chip asset – to hear them out and show them the door. What Goff seems to be unaware of is that the only significant ‘land’ remaining on Ports of Auckland’s books is the reclaimed rubble beneath the tarmac of the container terminals. Everything above that is core port operations. Nearly all the real estate has already been sold or taken out of Ports of Auckland, including the downtown Britomart precinct land, the Viaduct and associated land, Westhaven Marina and the Wynyard Quarter, Wynyard Point land. Moreover there is already a ‘property company’ for port land. 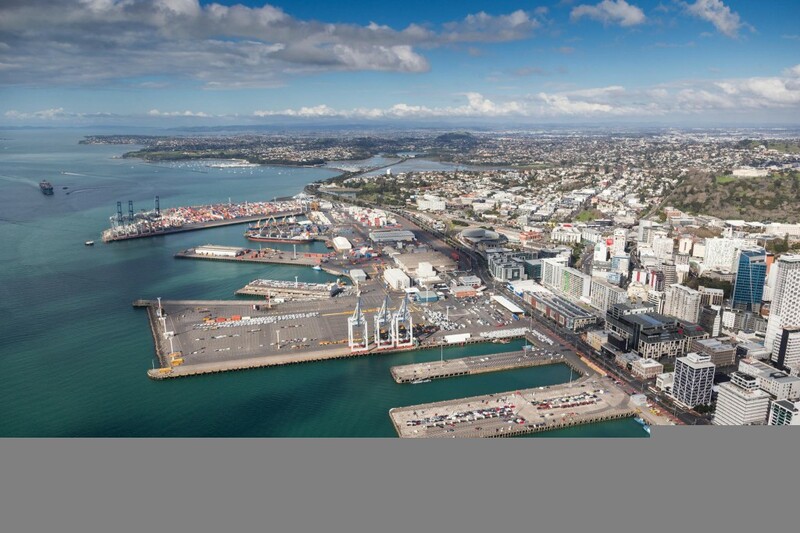 This is the CCO ‘Development Auckland’ – ‘Panuku’, which assumed the portfolio of Waterfront Auckland which in turn succeeded Sea + City, the agency the ARC set up to develop the Wynyard Quarter land (18 ha) taken out of Ports of Auckland by the ARC after we took 100% ownership in 2005. Be in no doubt, splitting the business from the ‘land’ is clearly a precursor to privatisation – in many ways reminiscent of the corporatisation of Telecom prior to its sale. For such a canny politician who has spent a lifetime in parliament (or is it because of this?) there is an apparent gullibility about Goff, revealed for instance by the reliance he places on official advice (no trains to the airport) and his commercially naïve statements like, ‘I believe the Port’s most valuable asset for Auckland is the land it sits on’, and the commercial silliness of aspiring to both relocate the port and to sell the port. Goff still does not seem to realise that if you sell a port, it’s not like selling a car. A sold port will not be taken off to a new home. In fact wanting to move the port is logically incompatible with wanting to sell the port. Such public opining by the mayor of Auckland, constantly raising doubts about the port’s long-term security of tenure just strips millions of dollars of potential value out of the company. Given this, if the port is sold you can be sure the international buyer is likely to get it at a knock-down price. However once gaining control no new owner is going to take seriously requests to take its newly acquired asset off somewhere else. This issue is not likely to go away. Goff the experienced politician whose key election platform as Labour Party leader during the 2011 general election was ‘Stop Asset Sales’ must realise how damaging these disclosures will be for his former parliamentary colleagues – just when Labour appears to be gaining momentum. After all it was the same Phil Goff who announced in 2011, ‘The National Party is highly embarrassed by the fact that most New Zealanders don’t want asset sales and the Labour Party is standing alongside New Zealanders in that view. In fact we’re leading the push back against the assets sales’.Almost certainly Goff would have preferred to have waited until after the general election before letting the cat out of the bag. For their part Bill English and Steven Joyce must be rubbing their hands with glee. Unfortunately Phil Goff’s equivocating ‘denials’ of what was discussed at a secret meeting last week with the port company chair and CEO (and leaked to the media by one of the parties) have only served to fuel the rumours. And Goff’s repeated comments about wanting to move the port have only added another element of confusion. I recall the last time a serious attempt was made to sell the Ports of Auckland, This was back in 1991- at the height of the ‘reforms’. The Auckland Regional Council which held 80% of shares (the Waikato Regional Council held the other 20%), was under instructions from the National government to privatise the company. Finance sector players like Fay Richwhite and Bancorp were deeply and lucratively involved. The suggested sale price (by these experts) was $200m which happily coincided with the ARC debt. Then came an enormous public outcry. At the height of it I was elected in a by-election to the ARC. Within two weeks, in March 1992, the late Bruce Jesson and myself proposed a notice of motion to stop the sale. After long and rather dramatic debate it was carried by 13 votes to 12. A year later the Waikato Regional Council did sell its 20% of shares. Immediately upon listing, to its dismay and no doubt eternal regret, the share price virtually doubled. This meant that from 1993 to 2005 Ports of Auckland was a stock-exchange listed company. However despite the magical properties, that star dust that some believe stock exchange listing brings, the company was for all those years outperformed and outsmarted by its provincial rival the Port of Tauranga which in a major strategic coup acquired the inland port at Penrose, under the very noises of the Auckland company. In 2005 soon after I became chairman of the ARC, we bought back the 20% listed shares and took 100% control of the company. The reason was two-fold. The Port was a sound blue-chip investment in itself, but it also meant we were able to divest the valuable Wynyard Quarter and ‘tank farm’ land out of the control of port executives (whose development plans for the area were frankly hopeless), and get the company to focus on its core business – shifting cargo more efficiently. Since the demise of the ARC and the advent of the Super City, there has been much less public oversight and transparency around the port company. In the leadership vacuum, it appeared to me that the directors began to act as if they were the owners. They soon came to grief in the employment court over a clumsily managed, bitter and very costly labour dispute in 2012 and then three years later the high court over the company’s pig-headed drive to reclaim the Waitemata Harbour. 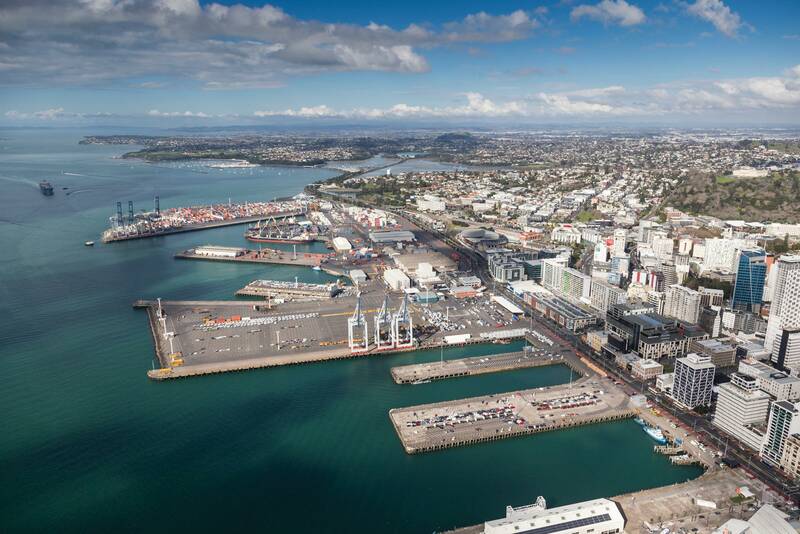 Still, since the decision to abort the sale in 1992, the port company has gone on to pay the Auckland region more than $1b in dividends, as well as bequeathing an extremely valuable real estate portfolio. That dividend stream enabled the development of the Britomart transport centre, the North Shore busway and in particular the infrastructure for the renaissance of Auckland commuter rail. But now for a number of reasons, it seems privatisation is back on the table and the circus is back in town. And predictably enough out front leading the parade, and banging a noisy drum is Michael Barnett of the Auckland Chamber of Commerce. It is not unexpected that the head of a business lobby group would take such a position – it’s his ‘brand’ as Michael would explain. However lobbying on behalf of the finance sector, so it can take a big clip out of the ticket of any privatisation to new owners, likely offshore based, is not going to win the hearts and minds of Aucklanders. So by necessity privatisation arguments must be dressed up as if to be in the public interest. It is this sales spin delivered in public good clichés, featuring ‘Ma and Pa Aucklanders’, and even ‘liberating’ the port (?? ), must be exposed for what it is. However Michael Barnett is not the mayor of Auckland, Phil Goff is and he is the primary problem here. Goff’s approach to the port is much less coherent than Barnett’s. Goff despite his obfuscating is clearly interested in selling the port, however he has also made it clear he wants to move the port. It appears he still doesn’t realise that if you sell a port, it’s not like selling a car. A sold port will not be taken off to a new home. In fact wanting to move the port is logically incompatible with wanting to sell the port. Such public opining by the mayor of Auckland, constantly raising doubts about the port’s long-term security of tenure serves to strip millions of dollars of potential value out of the company. Given this muddleheadedness, if Ernst & Young, Cameron & Partners, the Chamber of Commerce and council senior management get their way and the port is sold you can be sure the international buyer is likely to get it at a knock-down price. However there should be no illusions, once gaining control no new owner is going to take seriously requests to take its newly-acquired port off somewhere else. Goff also says he wants to keep the land but sell the company. Separating out the land and selling off the revenue-earning operating business is a dodge long used by those scheming to get their hands on the port. When I was chairman of the Auckland Regional Council I had to deal on a regular basis with hard-faced finance people (including the Sultan of Dubai) proposing variations on this scheme; to hear them out and show them the door. Goff surely by now must be aware that the only significant ‘land’ remaining on Ports of Auckland’s books is the reclaimed rubble locked beneath the tarmac of the container terminals. Everything above that is core port operations. Nearly all the worthwhile real estate has already been sold or taken out of Ports of Auckland, including the downtown Britomart precinct land, the Viaduct and associated land, Westhaven Marina and the Wynyard Quarter, Wynyard Point land. Interestingly Michael Barnett’s sales pitch is couched in terms of financial prudence, enabling Auckland to spend the proceedings on much needed infrastructure etc. This is not without irony given it was Michael’s lobbying on behalf of the trucking that helped land Auckland with the $1.8b ‘East West Link’, considered to be the most expensive road in New Zealand’s history – so lacking in demonstrable benefits, that NZTA is unable to contrive a meaningful cost-benefit analysis. (Very interestingly the main beneficiary is the Port of Tauranga’s inland port). Essentially Barnett’s argument (based on he reckons ‘real commercial sense’) can be boiled down to this: let’s sell Auckland’s principal strategic revenue-earning asset to pay for other, non-revenue earning assets. However these assets, (including the roads Barnett is championing), and City Rail Link will have high and on going operational costs. Once the proceeds from selling the port, after the brokers, the finance consultants and lawyers have had their chop, is spent, and the port company’s $40-$50m per year dividend steam is diverted to the new shareholders, (the annual shortfall would have to be made up with a 3% rates increase), who is going to be left to pay these operational costs? You guessed it, the ratepayers. That is why Barnett’s slippery sales patter and Goff’s commercial naivete, and lack of political principle should be seen for what they are. What should be done about the port? Apart from its sometimes, roguish attitude, by and large it is performing efficiently. Return on operating capital is similar to Tauranga. The major problem with Ports of Auckland (interestingly completely opposite to Auckland Council) is not cost control but constraints on its ability to earn revenue. This is due to the mutually damaging, race-to-the-bottom competition between Auckland and Tauranga over containers. This means what the ports can charge for containers is about 40% lower than what Australian ports charge. Auckland’s business strategy is almost entirely based on containers, Tauranga’s main game is bulk exports. Tauranga can bleed Auckland but still do OK itself. But if Auckland (and Tauranga) were to be able to charge something near the international going rate for handling containers, Ports of Auckland profits and dividends would be increased significantly, for example a mere $10 increase per container would mean $10m extra on the bottom line, $20 – $20m. There has been some improvement to this in recent years but there is still a huge commercial distortion which real leadership at Auckland and central government would set out to resolve – and there is a solution – a jointly-owned container operating company. The benefits for the company (both companies) and the people of Auckland (and the people of the Bay of Plenty) would be significant. On the other hand selling the port is selling out Auckland’s future generations. Selling is losing. One of Auckland’s new EMUs – but according to NZTA & AT you won’t be catching one of these to Auckland airport – not now – not ever. Auckland International Airport is of critical economic importance to Auckland and to New Zealand – it is the gateway to the country. Despite hundreds of millions spent in road construction in recent years, congestion on the route to the city is already near where it was 10 years ago, chronic at peak times, periodically at grid-lock. With airport passenger movements currently 17 million per year, and predicted to increase to 20 million by 2020 and 40 million in 2044, this congestion can only become more dire. However I should point out that the question of light rail to the airport is something of a sham; (one of the few people still taking it seriously is Mayor Phil Goff), given the government’s recently announced answer for Auckland Airport’s transport problems: light rail in 2047, buses in the meantime. I should add the only other supporters for trams to the airport are the bloggers at Transport Blog – self-styled experts who obligingly changed their Congestion Free Network ‘vision’ from trains to trams in line with the corporate position of Auckland Transport and NZTA. Vision on demand? This article appears in the May 2017 issue of Ponsonby News and The Daily Blog.